IRRI collaborates with USAID in engaging the youth into rice science while showcasing IRRI’s innovation and leadership in breeding, varietal development, climate change adaptation, and yield gap reduction. The fourth Cambodia Science and Engineering Festival, was a large celebration of science, technology, engineering and mathematics. 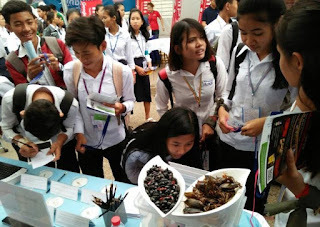 During the three-day event, the IRRI Cambodia Team engaged more than a thousand students and other young professionals through various interactive activities highlighting rice science. IRRI was invited to showcase its work in the country under the USAID tent. One of the highlights was a rice taste preference test on six locally-produced rice varieties. At the end of the event, majority of the respondents preferred CAR 15 among the non-aromatic varieties presented (43%) and Phka Romeat among the aromatic varieties (39%). The results show that the respondents preferred the variety with lower amylose content. CAR15 is also become a popular variety in the four provinces (Battambang, Pursat, Kampong Thom, and Siem Reap) under ASTV (Accelerating the adoption of Stress Tolerant rice Varieties by smallholder farmers in Nepal and Cambodia), a USAID-funded Project. On the other hand, Phka Romeat has long slender grains like Phka Rumdol (ranked as the best rice tasting variety for three years in a row). CAR15 has large, long slender grains and has 21.6% amylose content while CAR14 and CAR16, although with the same grain type has 25.6 and 25.1%, amylose content respectively. Another highlight of the exhibit was a quiz on “Can you tell if this is a rice or weed?” Students were asked to identify six samples with either rice or weed; including rice, weedy rice, wild rice, Echinochloa crus-galli, and Echinochloa colona. Through this quiz, students were able to learn that some weeds closely resemble rice. The students were also given more information about the types of weeds and how damaging these are. 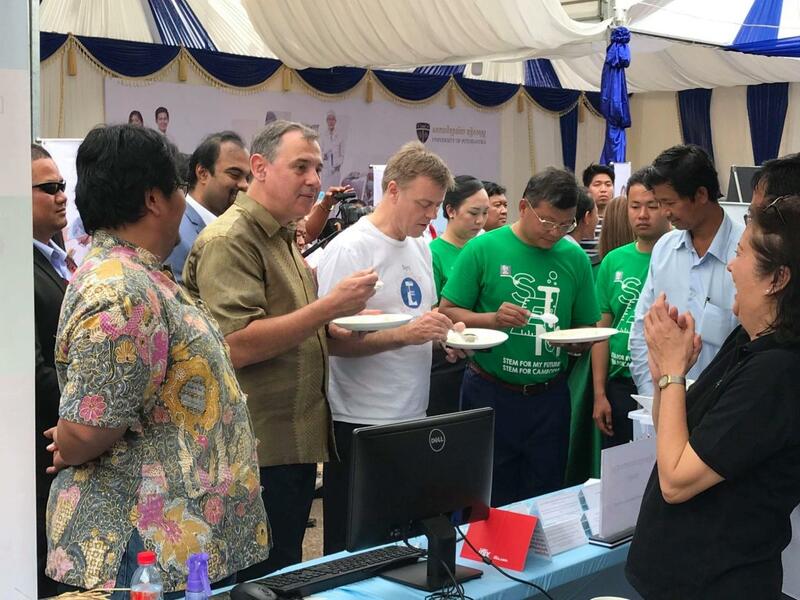 The activity became a starting point for conversations on pests and weeds in rice ecosystem as well as IRRI’s effort to design ecologically-based pest management strategy in Cambodia through EPIC, a USAID-funded research project. A total of 848 students took the quiz. To round up IRRI’s conversation piece on biodiversity in the rice fields, the team served cooked, edible insects from rural Cambodia. Students were invited to sample the insects, and learn from the posters about insect life cycles. The responses from students varied from repulsion and fear, to curiosity and delight. Many students sampled fried diving beetles, giant water bugs, and crickets. The festival was opened by His Excellency Hang Chuon Naron, Minister of Education, Youth and Sport, U.S. Ambassador William A. Heidt and British Ambassador William Longhurst. It was held from March 1 to 3 at the National Stadium in Phnom Penh.